The Eighth Judicial District Commission on Judicial Performance unanimously (10-0) recommends that Judge Joshua B. Lehman BE RETAINED. Judge Lehman was appointed to the Larimer County Court bench in 2013. As a County Court Judge, he presides over both criminal and civil cases, including small claims. Judge Lehman previously served as deputy district attorney in Fort Collins and also represented Federal Employees in appeals of adverse employment actions and discrimination claims. 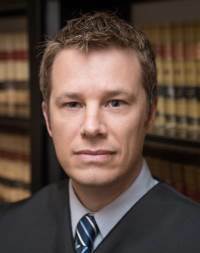 Judge Lehman received his Bachelor of Science degree from Wyoming University in 1998 and his law degree there in 2001. Judge Lehman enjoys his job and providing judicial excellence is important to him. As a jurist, he is aware of the heightened tension among litigants that appear before him and strives to create a courtroom environment in which all sides can have their voices fairly heard. The Commission conducted a personal interview with Judge Lehman, reviewed opinions he authored, observed him in court, reviewed comments received from interested parties during the evaluation, and reviewed survey responses from attorneys and non-attorneys who had experience with Judge Lehman. The survey asked “How strongly do you recommend that Judge Lehman be retained in office?” Of the attorneys and non-attorneys completing the survey, 95% of the combined groups recommended retention. Of the attorneys responding, 96% recommended retention, 0% recommended non-retention, and 4% made no recommendation. Of the non-attorneys responding, 95% recommended retention, 5% recommended non-retention, and 0% made no recommendation. A total of 27 attorneys and 57 non-attorneys completed the judicial performance survey regarding Judge Lehman. The very positive responses to the survey questions regarding Judge Lehman’s performance are indicative of his broad approval among the people that appear before him. Both attorneys and non-attorneys rated him well above average in every specific category surveyed. Among attorneys, his scores were particularly high the area of analysis of relevant facts and impartiality. Among non-attorneys, his highest scores were in the areas of demeanor and treating participants with respect. The Commission finds that despite being a relatively recent appointment to the bench, Judge Lehman is performing at a very high level. Commissioners were impressed with his response to interview questions and his demonstrated ability to be flexible in dealing with different parties under different circumstances. He is conscientious, fair and his performance will only improve over time.